Housekeeping is provided every third day of your stay. Additional service is available for $15 upon request. 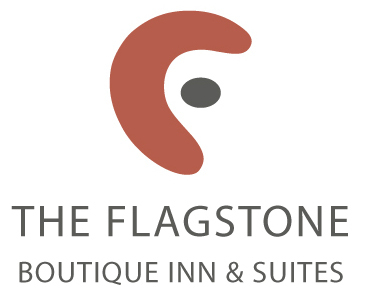 The Flagstone Boutique Inn & Suites is a non-smoking property. Designated outdoor smoking areas are available. There is a $250 charge for anyone smoking inside of their guest room. Each child over the age of 8 will be charged $10 night, if over double occupancy. There is a 13.52% tax rate applicable to those staying at the hotel. Pets must be well socialized around people and other animals, all dogs must be on a monthly flea preventive. Animals must be fully housebroken and dogs must be kept on a non-retractable leash at all times when outside of the motel room. All pets must be up to date on immunizations; make sure to bring a copy of shot records. You must clean up after your pet inside and outside and dogs may not be leashed/attached to the outdoor furniture. If your pet causes damage, you are fully responsible for cleaning fee, repair and/or replacement. A $10 per pet fee, per night applies. Animals in an animal free room will be charged a cleaning fee of $250.